Acquired by Lester James Hall in 1941 as a gift for his services in the Chinese National Air Corporation from a representative of the Chinese Government, and then by descent to the present owner. A luohan or arhat, is one who has reached the end of the Eight-Fold Path, and is not only perfect in himself but can help others to attain perfection. 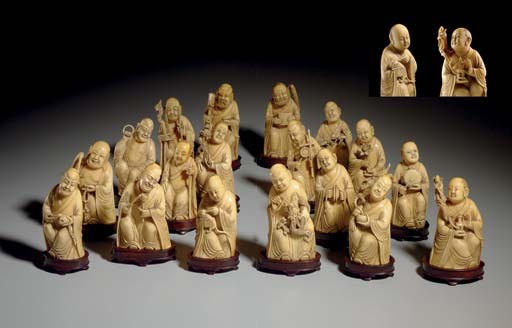 For another set of ivory figures of the Eighteen Luohan of approximately the same size (5½ in. high), also shown seated, most on rockwork, and holding their attributes, see Warren E. Cox, Chinese Ivory Sculpture, 1956, pl. 26. Unlike the present figures, those illustrated by Cox are painted.